Delhi’s vibrant nightlife and urban culture reflect in its café lounges. Trendy music, chic ambience, cosy interiors, great food and bar – these café lounges have it all. Whether you’re a college kid or a corporate person, the irresistible urge to have a drink or two with your pals is too hard to resist. 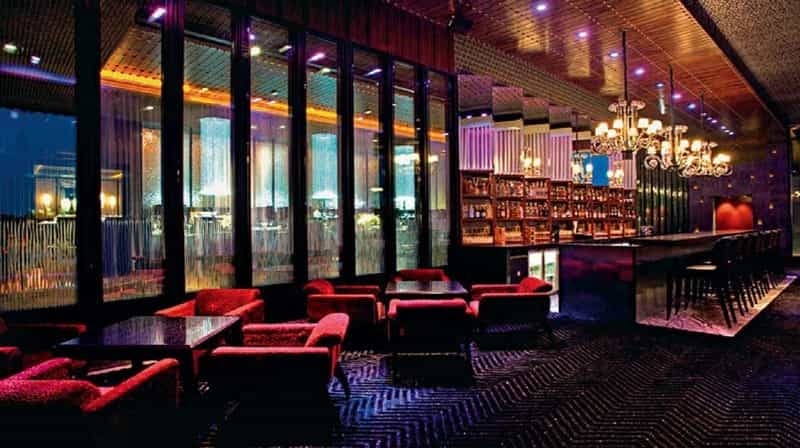 This list of the best lounge in Delhi is sure you satiate your weekend urges. With so many lounges in Delhi, it’s quite a task to find that perfect spot for hanging out with friends. To help you find the best café lounge in Delhi, we have come up with 5454 places, where you can enjoy yourself in the company of food and friends. Situated in Nehru Place, The Flying Saucer Café is a casual dining restaurant which serves Continental, Mediterranean and North Indian cuisines. It has a bar and smoking area, and outdoor seating too. You can be sure of the best quality food and a wide variety of menu items to choose from. Live music, soothing ambience and interiors make your dining a memorable one. Address: Ground Floor, Epicuria Food Mall, Nehru Place Metro Station, Nehru Place, New Delhi. Rated among the finest resto-pub and lounges in Delhi, Uncultured Café and Bar caters to party goers and romantic couples. Its menu offers a wide range of Chinese, Italian, and Continental dishes. There are an extensive liquor catalogue and Hookah varieties. Spacious seating for guests in the open terrace makes the perfect ambience for an enjoyable night out with friends. In the bustling Connaught Place in the heart of Delhi, Lord of the Drinks is the place to be if you want finger-licking food and liquor of the finest quality. Rustic interiors and luxurious outdoors makes the whole atmosphere beckon you to experience drinking and dining in style. Groovy music keeps your fingers tapping while you chat with your friends. A hit with teenagers, the lounge is great for partying with friends. In the urbane Hauz Khas, Hauz Khas Social is a vibrant all-day café and bar. The multi-cuisine menu has a wide variety of American and Continental dishes, which are served in their own unique and quirky style. The place is famous for its wide choice of exotic cocktails and scintillating drinks. Amazing ambience and interiors, with a view of the lakefront, makes the ideal setting for an exciting dine-out with friends. There are many things why Molecule Air Bar differs from the rest. The lounge resembles a chemistry lab, food is served in the shape of chemistry lab objects, lighting is in the form of molecules, and even their menu is designed to look like a World War II memorabilia. Their dishes are a mix of European, Mediterranean. Indian and Chinese cuisines, and are made using molecular gastronomy and liquid nitrogen. It’s a place of pure fusion food. Few lounges in Delhi have made their mark as Time Machine in Noida. The lounge serves some amazing drinks and cocktails, and their menu is carefully designed to include a wide array of options from Italian, Indian, Continental, Chinese, and World Cuisine. Sparkling lighting, vibrant interiors and spacious outdoor seating, with live performances, sports screening, and dance floor add magic to the place. Walking into Teddy Boy in Connaught place is like going back to the times of post-world war UK. Dim lights, vibrant interiors, leather couches, funky artwork on walls, recreates the perfect British-era ambience. The food is a balanced mix of Indian and International cuisines. A separate bar menu has an impressive range of wines, spirits, mocktails and cocktails. Live sports screening and a separate smoking area make the place a chill out zone. Located in Connaught Place, Ambrosia Bliss has a royal décor and flavorful food. Their menu has the best dishes of world cuisine. Whether hanging out with friends or dining with family, Ambrosia Bliss will charm its way into your hearts with its courteous staff. A full bar with smoking area allows you to drink and smoke. And yes, it is kid-friendly, as well. So bring your kids along for a great dining experience. In Connaught Place, if you want to get a taste of Bombay and its iconic street foods, walk into Bombay Bar. This themed bar and lounge have a specially designed menu, with dishes named after the many landmarks of Bombay. It includes foods from the famous Khao-galis of Bombay like Churchgate, Zaveri Bazar, Kharghar, Ghatkopar, to name a few. Savour sumptuous foods from Gujarati, Parsi, Irani and Kolhapuri cuisines. Aesthetic design and bold interiors are the first things you notice when you walk into Ministry of Beer in Connaught Place. The bar lounge has 3 floors with mechanical parts, antique lights, Victorian furniture that looks straight out of some sci-fi movie. The menu with dishes from world cuisine and a bar with steampunk décor and gothic design will transport you to a different world. Live DJ music, the dance floor will add excitement to your dining. Located in Rajouri Garden area of Delhi, Marine Drivve Club & Courtyard is a popular casual dining lounge for hanging out with friends or dining out with large families. The menu has a variety of delicious foods from Indian, Chinese, Continental cuisines. Lavish décor, warm ambience, dazzling lights create an aura of elegance. There are a hookah zone and a bar with a variety of wines and liquor to choose from. One of the most spacious lounge restaurants in Connaught Place, Warehouse Café has a vintage appeal. Its open terrace has spacious seating. Its menu has a wide range of dishes from American, Oriental, Lebanese, North Indian and European cuisines. The menu is designed like a calendar, with a dish for each day of the year. The bar has a variety of alcoholic drinks and wines. There is a smoking area and hookah with different flavours. This resto-pub in Mehrauli is a sheer delight for whiskey connoisseurs. You get the finest selection of whiskey, exquisite wines from the world, alcoholic drinks, cocktails, and other exotic drinks. Besides the bar, the food menu has signature delicacies from European and North Indian cuisines. The terrace commands a breathtaking view of the Qutub Minar. The rooftop ambience and seating in the open air gives a rich feel to your dining experience. Perfect for dining with friends and chatting over a chilled beer, Game of Legends – Sports Bar Grill & Lounge is a casual dining lounge and bar in Rajouri Garden. Sumptuous multi-cuisine food from Italian, Continental, Oriental, North Eastern, and North Indian cuisine will titillate your taste buds. Live music, DJ, HD screens, Giant Projectors give entertainment to guests. Interactive games and happy hours appeal to guests who stay late for the night. Located in Connaught Place, The Luggage Room Kitchen and Bar has luggage in all its forms like baskets, boxes, suitcases, trunks, backpacks. The menu has foods from Italian, Continental and Chinese cuisines. The drinks menu has all the usual hard liquor, cocktails and mocktails. Spacious seating, dance floor, live music, are the other facilities in this lounge bar. Situated in Gurgaon, Lock & Key has a vintage feel to it. The rustic ambience feels even more realistic with live jazz performances. Spacious seating, well lit up décor seems to soothe the nerves and relax the body. The menu has a wide range of American, North Indian and Continental dishes. It has a well-stocked bar with choices from fine spirits and wines. Its concept drinks are a special treat. It’s a place that is best for relaxing with friends over a couple of drinks. Located in Gurgaon, The Clock Tower is a gastro-pub with elegant ambience and open terrace seating. The menu includes a whole range of Continental, North Indian, and Chinese cuisines. The microbrewery, with its perfect lighting, creates a Victorian ambience and has a wide choice of spirits and wines. Live DJ, Dance Floor are the other facilities in this lounge. The chic ambience of Kill The Bill makes it ideal for birthday parties and get-togethers. It has spacious seating and mouthwatering food. The menu has delicacies from Mughlai, Continental, North Indian and Chinese cuisines. There is a good choice of wines, alcoholic drinks and mocktails. Live DJ, Dance Floor will keep the guests entertained while they party hard. Located in Connaught Place, Immigrant Café is a beautiful dining café and lounge. It has classy interior and open-air seating. The menu has foods from Italian, Oriental, North Indian and European cuisines. Its bar menu has impressive wines and other alcoholic and non-alcoholic drinks. There is live DJ and music, live sports screening and a smoking area. Finger-licking dishes and a lavish ambience make Masabaa stand out from others in Delhi. It has a multi-cuisine menu with dishes from Continental, Chinese, North Indian foods. Royal lighting and chandeliers give a luxurious feel to the place. Spacious seating makes diners comfortable to spend their time here in the company of friends and family. It’s a fine dining experience with a choice of liquors and hookah. If you love American food and culture, then PCO in Vasant Vihar is your ideal destination. Entry to this bar is through a password which has to be punched in a make-believe phone booth. The menu has speciality dishes from American cuisine. The luxurious décor creates a romantic ambience. There is a bar with liquors and cocktails and a smoking area. There is DJ and live music for entertaining the guests. Situated in Gurgaon, Takamaka is a multicuisine lounge and microbrewery with delicious comfort food from Italian, North Indian, Continental, Chinese and Mexican cuisines. It has its own microbrewery which makes beer and other spirits. It recreates the world of luxury cruise travel, with its elegant décor and classy ambience. Other facilities include live music, smoking area, live sports screening and rooftop dining. Located in Ghaziabad, Little After Dark is a pub lounge with classy décor and ambience. It offers a wide choice of delicious foods from Chinese, Continental and North Indian cuisines. Spacious outdoor seating lets you relax under the sky. This bar and lounge in Rajouri Garden let you enjoy a wide array of foods from North Indian, Italian, Lebanese and Mexican cuisines. The vibrant ambience with live music performances keeps the guests entertained. The bar menu has an impressive range of wines, spirits, alcoholic and non-alcoholic drinks. This resto-pub and lounge located in Hauz Khas Village have wood furnished décor and ambience. A multi-cuisine menu offers Foods from British, American, Continental cuisines. It is a perfect hangout place for music fans as they enjoy the live music and karaoke. Its chic interiors and laid-back ambience let you relax with drinks and friends. For those who enjoy smoking, there is a smoking area. These lounges in Delhi are the favourite hanging out places for people of Delhi. If you too have something to share, do so in the comments section below. And if we may have missed anything from the list, tell us about it.